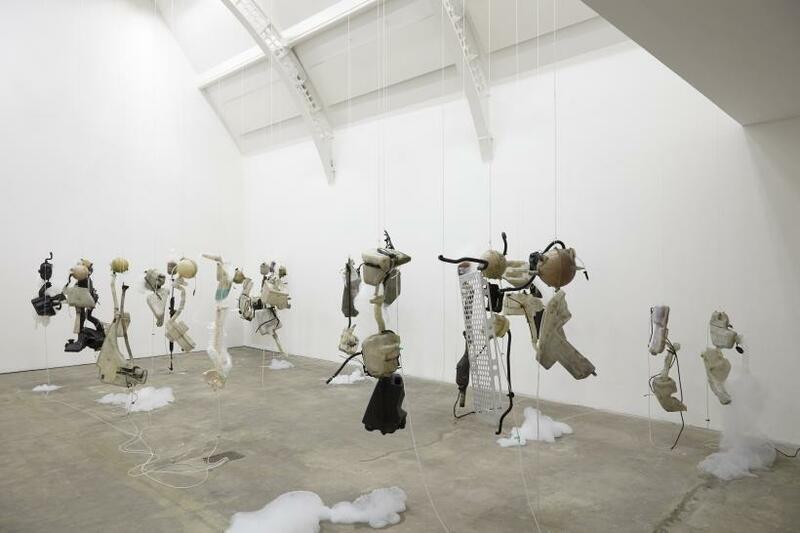 Roger Hiorns’ solo show at Ikon is suffused with the artist’s engagement in the wider city. An offsite project ‘Untitled (a retrospective view of the pathway)’ took place in Birmingham’s St Phillips Cathedral in June, the documentation of which is presented as a film in Ikon’s Tower Room, the choirboys lying on their backs to sing evensong. The sound of the choir flows into the second-floor gallery. 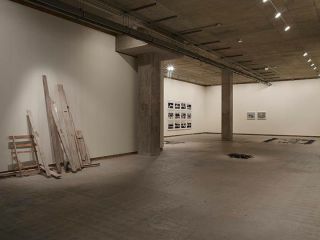 It becomes an active component to ‘Untitled’ (2013), a deconsecrated pulverised granite altar stone amassed on the floor. A once solid authoritarian object, it is now a defocussed mass of soft grey sand, its edges imprinted with footsteps, markers to its now unstable border to the world. Throughout the exhibition, Hiorns’ focus obfuscates and shifts the behaviour of materials to make the viewer an element of the work; our human essentiality implicates us as an active component of it. 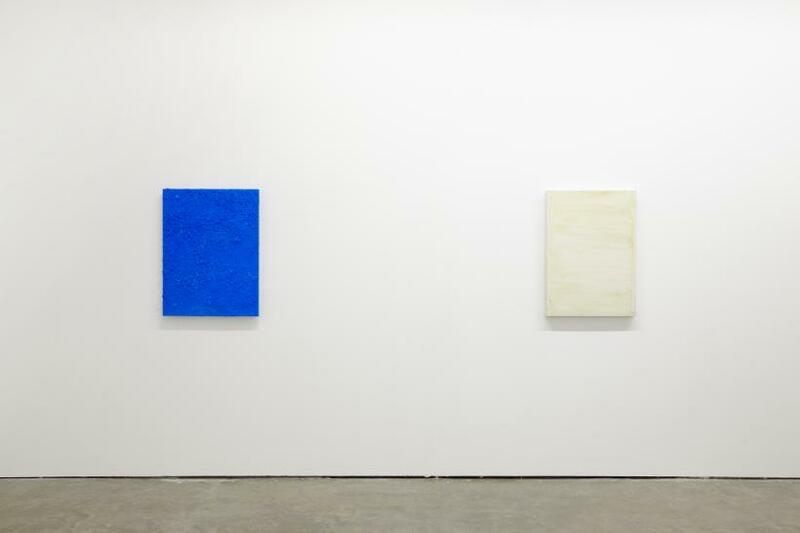 In the first floor gallery, two works on canvas are placed next to each other, one covered in copper sulphate crystals and the other a series of gestural brushstrokes painted in brain matter. 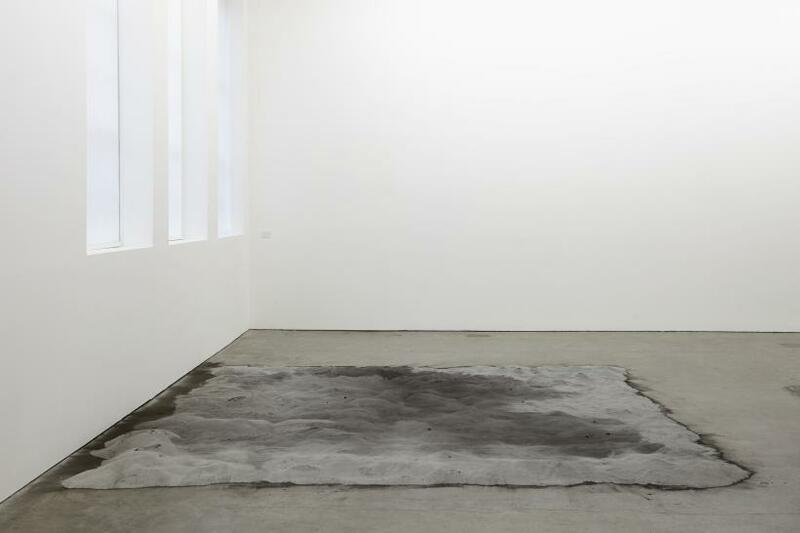 Seemingly disengaged, yet deeply connected, animal brain matter is used in both works, a material that undercuts aesthetics. 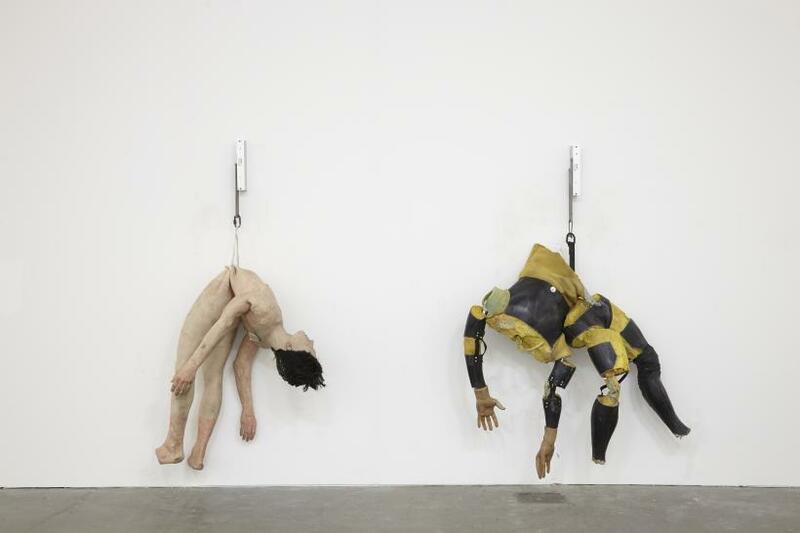 Hiorns’ works are charged with a bodily materiality, bio-politics, time and collapse. 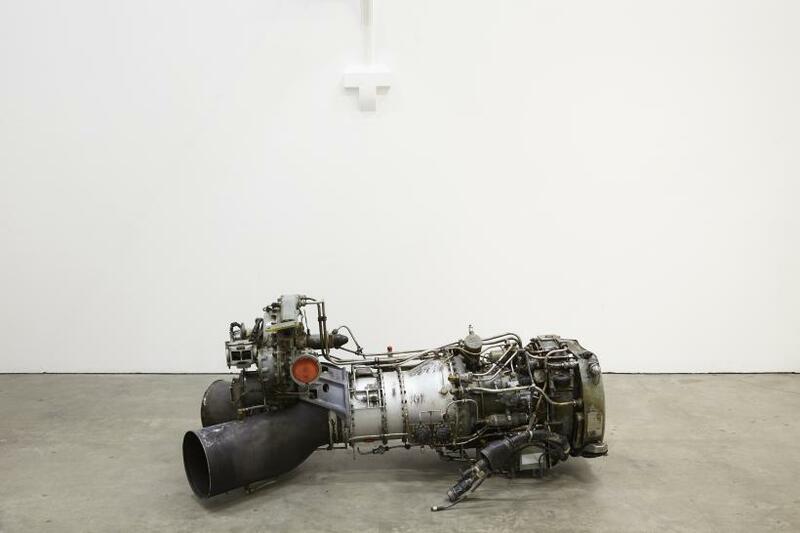 An atomised jet engine is placed on the floor next to the video work ‘Benign’. 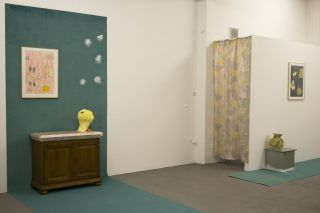 A series of paintings in decaying latex depict sexual acts between men, surrounded by clusters of disembodied erections. These are painted onto black polypropylene, a material for industrial packaging and labelling. A night sky to the jet engines mountain landscape. An adapted freezer offers a hole to rest your hand in; as your hand chills you wonder about the amount of time it would take to become frozen. Opposite, two animatronic figures are hung to the wall by electromagnets. They will fall once a day at an appropriate time. One is stuffed with Heidegger’s ‘Being and Time,’ the other with a small amount of animal brain matter. The inserted materials bring with them a density of thought and the implication of cognition, yet neither has an effect on the figures’ stability or collapse. 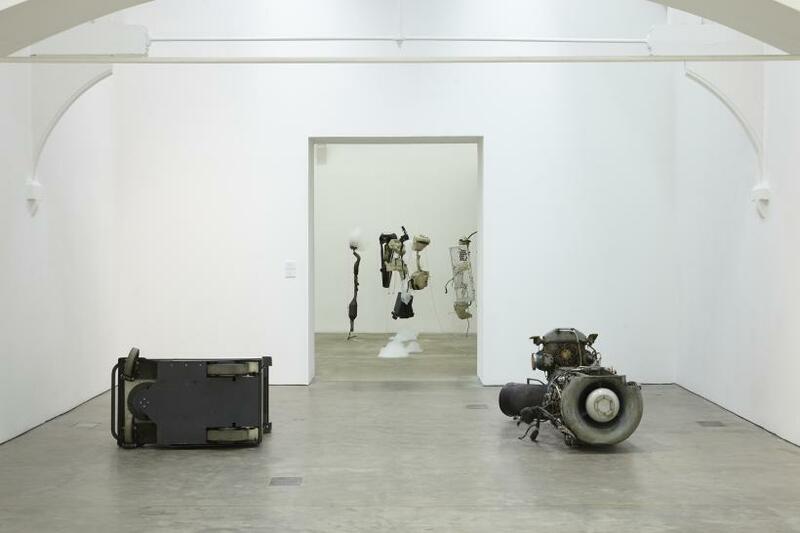 On the second floor gallery, you encounter ‘Untitled’ (2014), suspended car parts that hang as bodies in space; a compressor in each one emits foam that lands and decays, and hanging in the air is the smell of bath salts. One form has a spine enmeshed into its infrastructure, a splicing together of worn and used parts. 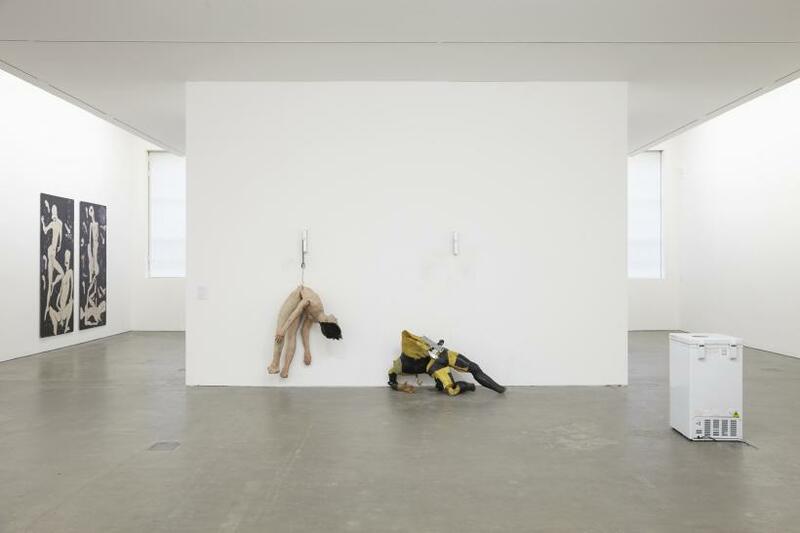 Each figure leaves its own imprint on the concrete floor. 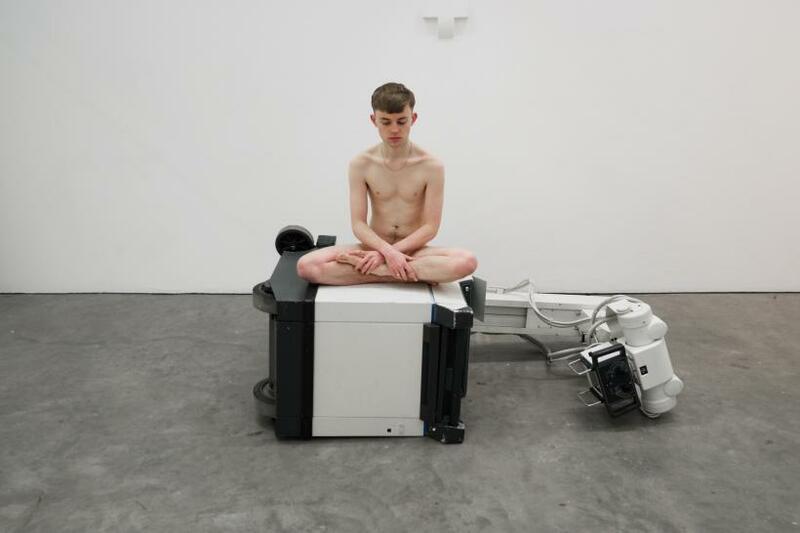 Programmed through the exhibition’s duration are a series of performances in which naked youths perform as material: sitting on a jet engine, adrift in the dust of the deconsecrated altar, by a decommissioned x-ray machine that lies prone on the floor. Flesh and consciousness placed as part of a work in which plastic tubes emit pillars of foam that dwindle into fragile ephemeral shells. This work with the body holds your gaze and returns it. This spectacle of skin, metal and foam is cross-infected with the spectre of neurodegenerative Variant Creutzfeldt–Jakob disease, as a broadcast of Joan Bakewell’s radio show ‘Inside the Ethics Committee’ debates the ethics of switching off a life support machine. Hiorns’ use of the city still lies ahead, with plans to bury a Boeing 737 within the Icknield Port Canal Loop, an area of urban dereliction that is a target for large-scale redevelopment. This action would place an impossibility within the everyday, a welcome monument to the wild oddity of the city’s post-industrial landscapes. 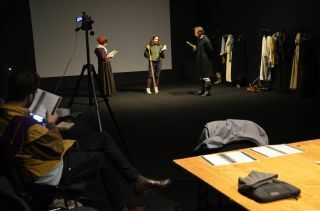 Performances of ‘Untitled’ (2011) take place on the following dates: 26 January 2017, 2–5pm & 9 and 23 February 2017, 2–5pm.